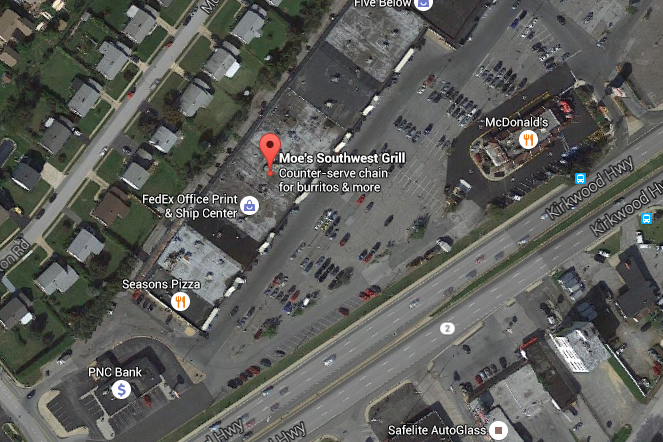 The location of the Moe's Southwest Grill in Wilmington, Delaware, where a camera was discovered in a women's bathroom. A female employee at a Delaware restaurant made a creepy discovery in a women's bathroom, according to authorities. Delaware State Police said Tuesday a worker at Moe’s Southwest Grill on Kirkwood Highway near Wilmington located a tiny digital camera inside the restroom. She told police the camera was positioned in a way so that it could record images of women using a specific toilet. Sources who say they reviewed the memory card video were alarmed at what they found, describing the images as a disturbing invasion of privacy. They estimated there could be more than 100 individual video clips of women using the restroom. Among the most troubling images, we were told, were of a little girl believed to be 5 to 11 years old. Police said they were informed of the camera on March 19 and their investigation is ongoing, with detectives conducting interviews and reviewing the physical evidence. A request for comment from Moe's corporate office was not immediately returned. However, a spokesperson confirmed to 6ABC there is an ongoing investigation and the franchise owner told the news station they are working with police. Anyone with information is asked to call the Delaware State Police Major Crimes Unit at (302) 365-8567. Tips can also be submitted by calling Delaware Crime Stoppers at 1-800-TIP-3333, texting 274637 while using the keyword "DSP" or online here.